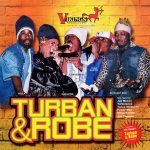 In 2003, D. Brown and V. Harriot produced the “Turban and Robe Riddim,” for Vikings Productions. The various-artist compilation features Capleton, Sizzla, Vybz Kartel, Anthony B, Elephant Man, and more. It is an average early 2000’s Dancehall riddim. The eponymous track of the compilation, performed by Capleton, is one of the best track of the album. Capleton delivers so much energy that it makes it up for the production that isn’t that great. Do not hesitate to leave a comment below to let us know what’s your favorite track on the riddim. You can also share this post on social networks if you like it.